Today we're starting a countdown of the 10 most exciting, cutest, noteworthy and/or memorable ways that 2013 is one year that we won't forget. 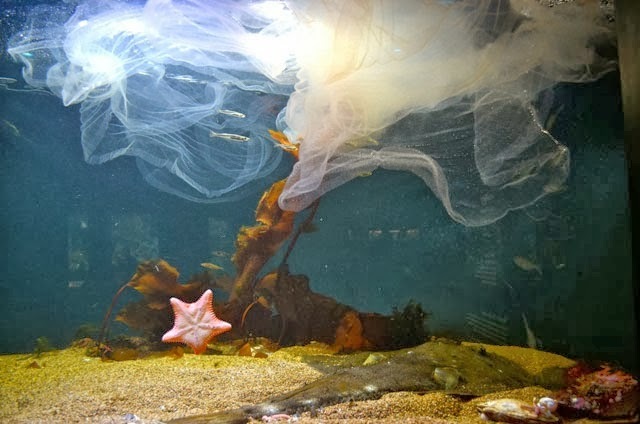 The goosefish wowed everyone by laying several egg veils this year, and this year the camera (phones) were rolling! 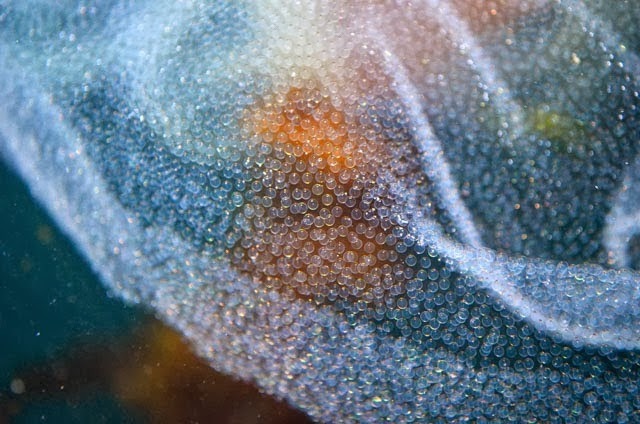 Her egg veil is a beautiful, gossamer sheet composed of thousands and thousands of eggs held together in a single layer. 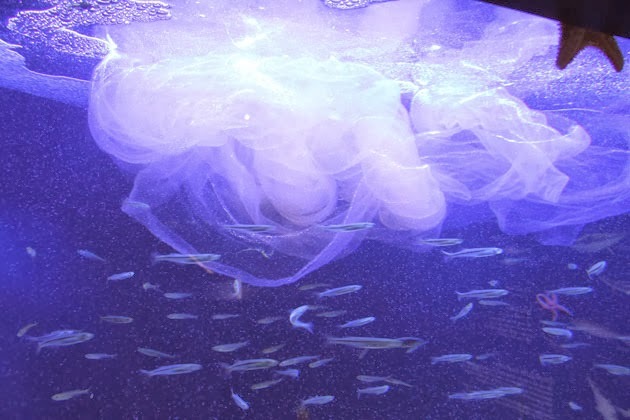 The eggs aren't fertilized because there is only one goosefish in the exhibit. But they are quite beautiful. Each egg veil remained in the exhibit for a couple days so visitors could enjoy watching it billow and flow throughout the exhibit. The goosefish spends most of her time laying flat on the bottom of her exhibit, impressing everyone with her huge size, enormous mouth and intricate fringe. Sometimes she raises her modified dorsal fin, her lure flitting about to entice a meal near her giant maw. You might even see her eyes tracking something on the other side of the glass—like a camera! 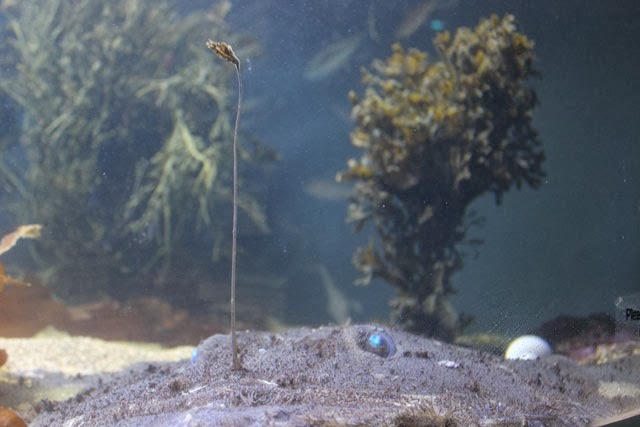 Aquarist Bill Murphy had his video camera to catch the goosefish laying the egg veil last May! This post explains that the egg veils are usually the same size, even if several are laid in one year. This video captures the grace and etherial beauty of the egg veil in the exhibit. See a close-up picture of the goosefish. Find a picture of the egg veil from above. Watch video of the goosefish herself snatching up a snack—in super slow motion! Our current octopus has some eggs of her own that's she's keeping watch over. Learn about octopus egg laying in this post. Did you know that an octopus enjoys playtime? Look beyond the dinner plate. Get to know New England's favorite crustacean—the lobster! Meet some of the lesser-known sharks and rays at the Aquarium.